POMONA, Calif. — Filipino and Hispanic community members rallied at the Pomona Economic Opportunity Center on Friday, March 4 to launch the campaign for Senate Bill 1015, aimed at protecting the dignity and rights of domestic workers and families. 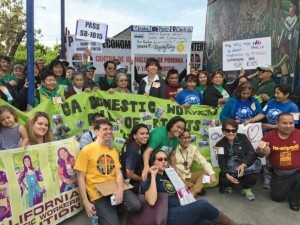 Senator Connie M. Leyva (D-Chino), who championed the bill, joined with community members, activists, leaders, and civil rights organizations in support of the law. SB 1015 builds upon Assembly Bill 241, the California Bill of Rights, which was signed into law by Governor Jerry Brown in 2013 and grants overtime protections to California’s privately hired domestic workers, improving their quality of life. SB 1015 builds on that bill’s success by removing the “sunset provision” that designates January 1, 2017, as when the law expires and will no longer be in effect (unless reinstated or extended). Leyva’s SB 1015 will make the law permanent. Emily Uy, a member of PWC and a personal attended, shared that she worked as a live-in home care worker who was on call for 24 hours a day. Her salary, however, did not match the long hours she worked.